Frost came in the night to coat everything with its thin layer of white. Luckily, I picked a good deal of Swiss Chard and cooked it up for freezing. I covered nothing in the garden. It was so cold and clear last night that I should have realized we were on the brink of a frost. I only remember looking up at the stars and thinking how nice they seemed, and how nice it would be to sit out under them. Then I remember thinking nothing at all except how to most quickly get in bed. It was that kind of day. 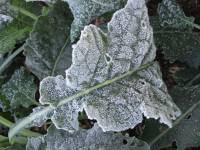 The leaves of the chard, kale, parsley, and broccoli are heavily coated. I'm waiting for the sun to swing around and show me what has really transpired. I ventured out again to mourn my plants and tidy up. Miracle of miracles! They were all fine. Parsley, kales, and swiss chards stood in the sun like nothing had happened. I was duly impressed.